To request park repairs please call 311 or 713.837.0311 or submit your request online by clicking this link. West of downtown Houston, near the headwaters of Buffalo Bayou, a massive flood control project built by the U.S. Army Corps of Engineers stands ready to hold back potential floodwaters. Addicks Reservoir, north of Interstate 10, and Barker Reservoir, to its south, together constitute nearly 26,000 acres set aside as flood zones to retain runoff from storms that would otherwise rush downstream and swamp roadways, homes, and businesses in metropolitan Houston. Most of the year, these wide-open spaces are free of floodwater. They were set aside for secondary uses after the reservoirs were built, mostly for agricultural purposes and oil and gas leases. The City of Houston recognized the recreational potential for this land, particularly in regard to the explosive suburban growth that part of the city has experienced. The Cullen Foundation donated substantial funds to be matched by the city in a continuing program to develop park resources in Addicks Reservoir, and in 1973 City Council approved a plan to lease a large tract from the Corps of Engineers. They named it Cullen Park. Usage studies and planning followed, and the lease was formally signed in February 1983. Construction on Phase 1 began in 1984, with subsequent projects following. The result of this activity is one of America's largest urban parks, 9,269.82 acres of outdoor recreational potential, much still in a natural state. A ball field complex beckons athletes to batter up and swing for the outfield, and soccer enthusiasts have well-kept fields to play on. HPARD holds organized sporting leagues throughout the year at these facilities, which teams can participate in via the Recreation Division. 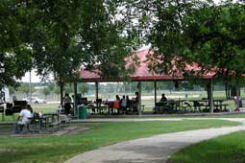 Picnic areas invite folks to dine outdoors, with covered tables near playground equipment and barbecue facilities. One picnic area is in a fine old pecan grove. There are wide-open fields all around them, perfect for dog walking and flinging a disc. Park visitors interested in enjoying the scenery can walk or ride their bikes along the paved trail that begins at the Phase II picnic area and ends 3.34 miles later at Highway 6. The trail takes you past a historic cemetery that predates the reservoir, wildflower plantings, 2 wetland environments, and through the shade of splendid oaks. In addition, there are 5 miles of trails in other areas of the park, some of which follow the picturesque banks of Mayde Creek. The Archery Range previously at Memorial Park has been moved to Cullen Park. 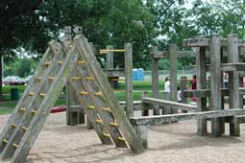 It is located in an isolated area for safety purposes, at the eastern edge of the park. You can find it at 13751 Clay Road. Kids can cool off in hot weather at the HEB water playground. Running under the oversized misting flowers, cavorting beside the spouting whale, and getting hit by water squirting from surprise geysers will exercise the little ones and delight their sense of whimsy. And, why shouldn't grown folks indulge themselves, too? Within Addicks Reservoir is Bear Creek Pioneers Park, leased from the U.S. Army Corps of Engineers by Harris County Precinct 3. Highlights of this 2,168-acre park include three 18-hole golf courses and the Houston Farm and Ranch Club, a covered rodeo arena used by 4H Clubs and FFA and FHA clubs, local scout troops, and the Harris County Fair. Texas Cooperative Extension does research and offers educational opportunities in landscaping and agriculture through the Texas A&M system. The park also has hiking and biking trails, picnic tables, and game fields, and a wildlife habitat where ducks and geese, ostriches and rheas, bison and longhorn cattle, and other species are displayed. Across Interstate 10, in Barker Reservoir, is George Bush Park. Consisting of 7,800 acres, it is a Harris County Precinct 3 project. This park includes a shooting range for firearms enthusiasts, a model airplane field, and an equestrian center for horse lovers. A 15-acre dog park invites Houston pooches to exercise and play off-leash. Ball fields and picnic areas are plentiful. The Great Southwest Equestrian Center, at 2501 S. Mason Road, is an 80-acre complex that hosts many horse shows per year. It offers 5 outdoor and 4 covered arenas, and stalls for 1,000 horses. The on-site Mansion has ballrooms for a variety of social events. Also nearby is a 27-hole golf course at Pine Forest Country Club, at 18003 Clay Road. West Houston Lakeside Airport is located at 18000 Groschke Road.